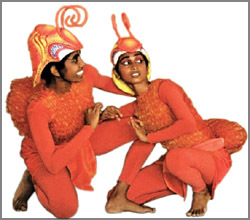 BALLET: Await Kumbi Kathawa (Ant story), the newest children’s ballet from the Chitrasena Kalayathanaya will go on boards at the Bishop’s College Auditorium on September 7 and 8 at 6 p.m. and 8 p.m. and on September 9 at 5.30 p.m. and 7.30 p.m. 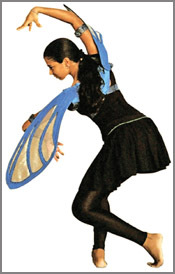 The Chitrasena-Vajira combination is renowned for inventing a dance form with the Sri Lankan touch - the Sinhala Ballet. Throughout the years they have added many memorable productions to our aesthetic scene. Adult ballets such as Karadiya, Kinkini Kolama and Nala Damayanthi and children’s ballets like Hapana and Ran Kikili have won high accolades from thousands of spectators, marking them down as a part of our cultural heritage. 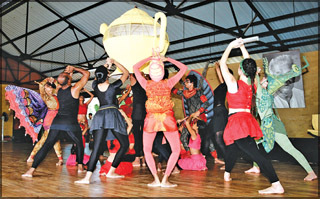 Now Kumbi Kathawa, yet another children’s ballet, is ready to succeed its ancestors. Kumbi Kathawa is a story of which brings forth many human qualities such as the strength of unity, work for the greater good of the community, greed and corruption, not succumbing to despair, a positive outlook towards life, quick thinking in a moment of crisis, forgiveness and compassion. The participants of the ballet are children who have been students for between one to 20 years at the Chithrasena - Vajira dance foundation. Anjalika (Chitrasena and Vajira’s daughter) and Mahesh are the directors of Kumbi Kathawa and the story drew its inspiration from a popular Russian children’s tale. The duo also got together to design the stage sets and costumes. It took them five years to put this creation together. Two foreign students from San Diego will also take part. Kumbi Kathawa is supported by the Nation’s Trust bank. Kumbi Kathawa does not include ants alone. 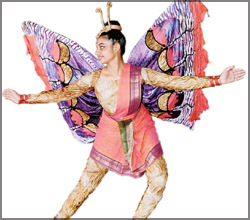 Audiences will be captivated by the graceful movements of characters portraying butterflies, grasshoppers, ladybirds, fireflies and a mosquito. Their goal is to transport the beholders into a fantasy realm of the insect world. The ballet will open with a scene of the ants’ daily life style. They are known to be hard workers and that is exactly what the opening will portray as figures dressed in colourful costumes scurry along the stage. Then after a sequence of entertaining scenes comes the enemy! The mosquito invades the stage and the dwelling of the ants. Tragedy and danger follows and the ants have to flee in search of a new home. Feelings of discouragement and pessimism exist but strong emotions and bonds hold them together. PAINTINGS: The Alliance française de Kandy, established in Kandy in 1967, has now reached the prestigious age of 40 years delivering remarkable service to the field of promoting French language and culture. To celebrate this historic event the institution has programmed a series of cultural events throughout the year. AYA 2007 is one of the major events in their cultural calendar which will be held at the auditorium of the institute from September 7 to 14. 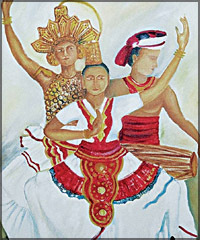 The concept of AYA was conceived by Dr. Jacques Soulié, the Director of Alliance française de Kandy in 2003 and emerged as an annual cultural event. Fifty paintings selected from entries submitted by 18 Alliance Young Artists who have successfully participated in the past AYA exhibitions will be on display. The participants are from Kandy, Gampola, Matale, Mawanella and also from distant southern town of Matara. The paintings submitted for display are mostly done in water and oil colours. There are few positive examples of major talents in the making. Some of the paintings reveal the use of bold brush strokes with greater freedom, harmonious blending of forms and colour and also fresh creative vigour and maturity. AYA 2007 is a rare aesthetic encounter which offers rich and rewarding visual pleasure for the art lovers of the Hill Capital. DAILY LIFE VS ABNORMALITIES: Two of Vajira’s creations. PAINTINGS: To paint a picture or design a form of artistic creation, the artist needs to be able to see what he is doing. This may seem oblivious but it is important for the visual arts are those most directly linked to our physical senses - more particularly the sense of sight. This does not mean that the artist is limited by what he can see. Nothing could be further from the truth for each human being has his own view of the world about him and what the artist ‘sees’ and tries to express is personal to him. His work is influenced not only by his experience, temperament, knowledge and understanding but by his particular emotions at a given time. 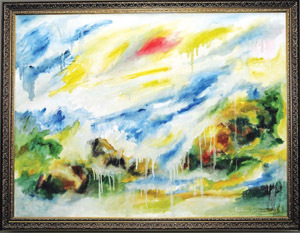 This is Vajira Gunawardena’s approach to painting. The artist will be holding an exhibition of oil paintings titled “The Dream Factory” at the Barefoot Gallery from August 30 to September 9. “My work is always connected with my daily life. My creations spring out of the social and political structure of the modern era. I seek the perfectly ordinary events in day-to-day life but this is driven from a very limited point of recognition. The reality is that this is like a blissful blindfold and the abnormalities of the world are neglected. There is only one method for us to bring it to the rear - through art. The artistic touch is the gleam in the thick darkness or shadow in the light of day,” expressed Gunwardena. The artist’s work consists of semi abstract images: disfigured human profiles, heroes with exceptionally enlarged sexual organs, politics and war, Sri Lankan materialistic fantasy, new individualism, daily life experiences, television, market force, consumer goods and figures of popular commodities in the urban life as chosen signs with text and word of commercial myth. “Art is a medium from which I express my emotions of the contemporary social environment. It is like a visual diary unfolding before my eyes. 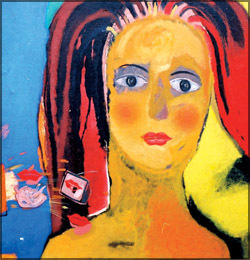 It depicts the external struggle of a contemporary Sri Lankan personality who was born embodying this culture,” he explained adding that he prefers to use exceptionally bright colours in his work. Why did you name the exhibition “Dream Factory”? “Two ideas emerge with painting: how to paint and what to paint. We need to explore more on what to paint because we can learn the styles of paintings at an institute. An artist is born out of the way he thinks, not from the medium he uses,” he said. 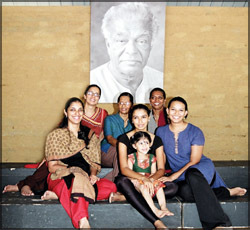 “The Dream Factory” will be Gunawardena’s third solo exhibition. 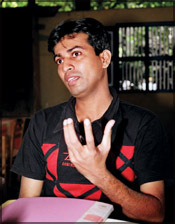 He is the holder of a Bachelor of Fine Arts Degree from the Institute of Aesthetic Studies in the University of Kelaniya and has a diploma of production design at the Sri Lanka Designing Department with the Cottage and Textile Industries Department. 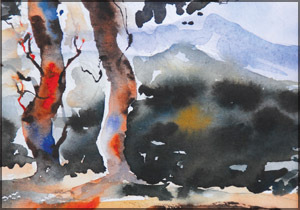 He held his first solo exhibition, “My Recent Paintings”, in 2005 at the Paradise Road Gallery, Colombo, and his second in 2001 at the Lionel Wendt Art Gallery. 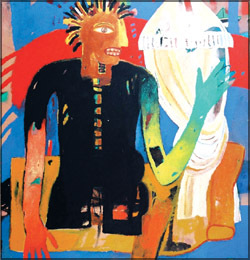 Gunawardena had also taken part in many group exhibitions and had even presented his work at the “12th Asian Art Biennale Bangladesh 2006” held in Dhaka in 2006. He will be representing South Asia in a residential artists’ camp in Spain in October. CINEMA: South Indian Tamil movies like Sivaji are runway hits not only in Sri Lanka but the world over, but Bollywood seldom produces good movies. The Sinhala cinema industry has produced many remarkable movies and managed to earn a good name. Movies such as Ammawarunae and Uppalavanna are much far better movies than most of the Indian hits. This was the revelation of M. Sivalingam, vibrant Tamil writer and a rationalist, who came out of Regal theatre after watching Uppalavanna and met me at the Lake House reception. Sivalingam, who received the Sahitya award twice, one in 1993 and the second in 2004, is leading a moderate life in Kotagala. Though he isn’t a frequent moviegoer, he doesn’t miss a good Sinhala movie. Sivalingam has so far released three books, two short story collections and one translation. ‘Born to labour’ is the book he translated into Tamil, a book by the English writer from the plantation community, the late C.V. Velupillai, Sivalingam who had written more than 50 short stories and 20 of his plays had been staged in Colombo and in plantation areas. He owns many comedy and satiric articles. All of his books and writings have one thing in common, his concern for social uplift. He remains as the founder member of the Upcountry People’s Front and at one time its general secretary. He was also the former deputy chairman of the central provincial council. Perhaps he is the one and only upcountry Tamil politician who were able to engage in creativity. “A politician who also has the ability in creative writing will understand people’s problems much better” he pointed out. But will such politician be successful in today’s political atmosphere? Perhaps not. Coming back to the Sinhala cinema, Sivalingam categorised Ammawarunae and Uppalavanna as films of Buddhist views on human life entangled between war and social life while Purahanda Kaluwara as a movie trying to reiterate the evil behind war. He also observed that there are many young Sinhala directors who are willing to speak against war and social inequality through their movies. This is highly appreciated by the Tamil population. “Art must unite and integrate communities and the Sinhala movie industry and teledrama industry are playing significant roles in this spectrum” he says. He said that C.V. Velupillai is his guru. Veluppillai was born in 1914 at Madakumbura, Punduloya in a Kangani family, wealth enough to educate him in English medium schools. As far as I know, there is no match for C.V. Vellupillai in the Sri Lanka literary field as he was an English poet, story teller and a vibrant writer. When Rabindranath Tagore visited Colombo in 1943, C.V. met him and gifted him with a book of poetic drama written by him and dedicated to Tagore. The book titled Vismadgene was published by ANCL. 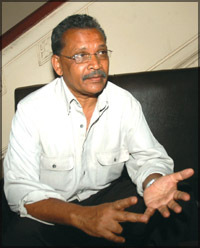 C.V. Velupillai describes Vismadgene as a ‘book of lyrical drama in act. C.V. Velupillai describes his book as the wild flower of his garden. He studied at Holy Family (Nuwara Eliya), Islands (Hatton) and Nalanda (Colombo) in English medium. All his literary works were in English. “Upcountry Tamils have a 200-year-old history but this community failed to show its social value and the problem of the outside world through its political strength but its plight was successfully revealed by powerful writers and tireless workers such as C.V., Theliwatte Joseph, Anthony Jeeva etc. There are Tamil literatures in Tamilnadu literature, Malasian literature, migrant literature (literature by those Tamils who migrated from Sri Lanka and settled in various parts of the world) and upcountry literature. 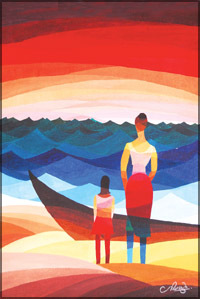 This upcountry literature is unique because it reveals the conquers of the society. Upcountry is a beautiful place and there are so many pretty things to influence the writers mind. But these writers left them aside and created poems, short stories, and novels using human sufferings, poverty and inequality as their base for writing. The much awaited political strength came much later,” Sivalingam further elaborated. He said that he feels very sorry to note that very little effort have been taken by the present generation to push the upcountry literature forward. The upcountry youths have embedded themselves into the South Indian cinema and highly commercial TV serials, which he observes ‘brought the creativity to a grinding halt’. “We must learn from Sinhala artists. At the inception they inherited from South Indian filmdom. Later they managed to free themselves from Indian maya and created a powerful base rooted in Sinhala culture. Upcountry Tamils failed miserably in doing this and is still under the influence of Tamil Nadu’s commercial culture. We failed at what C.V. built. But young Sinhala directors such as Prasanna Vithanage are doing a wonderful job. They are also using this medium for community integration,” says Sivalingam who is in his late 50s. Murugan Sivalingam’s native place is Talawakelle, born at Middleton estate. In 1965 he was at Virakesari the national Tamil newspaper, working as a journalist and later became a teacher before he chose to serve people through party politics. “The need of today is a strong and visionary leadership with long term objectives, but what we have is politicians aiming for the very next election,” Sivalingam lamented. EXHIBITION: An exhibition of paintings by Madawa Sanjeewa was held recently at the Lionel Wendt Art Gallery. 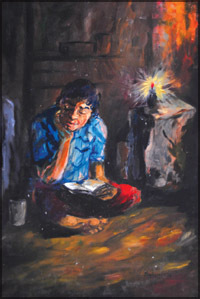 An old boy of Ananda College, Colombo, Sanjeewa received his primary training in engineering but he also placed his first step into the field of art through his school days. Then it had been a slow upward climb for this talented youth. He had to engage in a mission of finding his own mode and style through self study. Sanjeewa spent most of his leisure period embarking on a mission of experimenting with the brush and pallet. He learnt to express the non verbal languages of the inner self through the noble creativity of art. He said that his work helps to relax the mind and leads to deep thinking, bringing forth strong emotions and psychological therapy through colours. He had won a number of medals, diplomas and certificates for his creations. 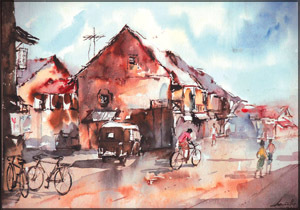 Media Personality Edwin Ariyadasa once expressed that the paintings of Sanjeewa’s “as abstract in concept, communicating a sense of tranquility. In a few he portrays human figures, expressing such sensitive experiences as a mother’s love of her infant child... What comes through all this is a deeply reflective attitude of mind.